October 27, 2005, Greencastle, Ind. 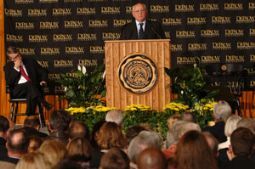 - The challenges of the future are security, poverty, and the "global environmental crisis," Mikhail Gorbachev told a capacity crowd of 3,000 in DePauw's Lilly Center this afternoon. 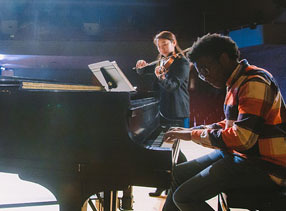 An overflow audience of approximately 1,000 more people watched the Timothy and Sharon Ubben Lecture via a closed circuit television feed across the street in Kresge Auditorium of the Performing Arts Center, and about 250 logged on to watch a live webcast. [Download Video: "Overcoming Political Paralysis" - 3562kb] "Looking at the situation, we understand that we need political will; we need to overcome the paralysis of political will." Gorbachev added, "We see that world leaders are still stuck in the past century. 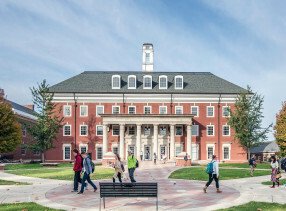 They're still responding to events," and not developing a comprehensive plan to deal with the coming changes. 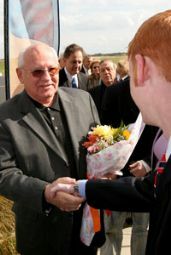 The 74-year-old leader, the recipient of the 1990 Nobel Peace Prize, is on a brief tour of the nation to mark the 20th anniversary of "perestroika": Gorbachev's reforms that helped restructure the Soviet economy and end communism. 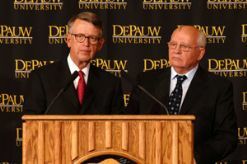 His speech at DePauw was entitled, "Security and Environment: The Challenges of the 21st Century." The man who led the Soviet Union from 1985 to 1991 talked of a time, perhaps only 15 years away, when demand for the resources of the world will far outstrip supply. Things we take for granted, such as water, may be the basis for future wars between those who have the resources in abundance, and those who need them badly, Gorbachev predicted. His presentation was filled with gloomy statistics that suggest a coming collision between a growing world population and food, water and energy supplies that will be stretched beyond a breaking point. As founder of the environmental advocacy organization Green Cross International, [Download Video: "Man vs. Nature" - 4795kb] "I've been working on these issues. I know the situation, and I believe the situation in the world today is a conflict between man and the rest of nature," the former Russian president, speaking through an interpreter, declared. "We've come to a point where the biosphere is being destroyed... this is our home. This is the only environment in which we can live... it is being destroyed." 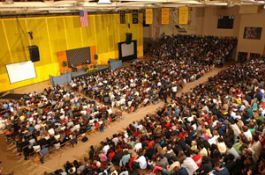 One of TIME magazine's 100 most significant people of the 20th Century, and the same publication's 1990 'Man of the Decade', Gorbachev spoke to the crowd that packed DePauw's athletic fieldhouse of opportunities lost. [Download Audio: "Missed Opportunities" - 915kb] "I would say that initially there was tremendous hope that after the end of the Cold War, which we announced when we met in Malta with President (George H.W. Bush)... that there would be enormous changes for the better, with great expectations," Gorbachev recalled. The talks created treaties that the leaders hoped would lead to greater international cooperation and "changing the world order." But, sadly for Gorbachev, "that process slowed down, and the opportunities that we had are not fully used. Very little has been done to seize those opportunities on the international scene that perestroika opened." 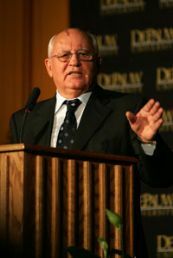 While world economies have been globalizing, but the process has been "uncontrolled," Gorbachev asserts, and "political leaders were not able to fully use the advantages of the end of the Cold War." Instead, nations have been taking a unilateralist, "we'll fix this by ourselves" approach to solving the world's problems. [Download Video: "United Efforts" - 4193kb] "I believe that that was a strategic blunder. It was the wrong vision. If we live in a global world in which everything is interrelated, in which whatever happens in any region affects other regions and countries, you cannot solve those problems by going it alone, you need united efforts." 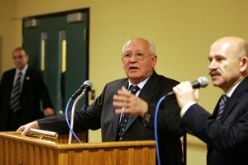 Politicians have been slow to embrace the importance of working to end poverty and deal with mounting environmental challenges, Gorbachev states, but citizens -- especially younger people -- are getting it. [Download Video: "Optimism" - 3887kb] "Mankind is now more aware of these problems, and that is what makes me optimistic that the situation will begin to change," Gorbachev added. 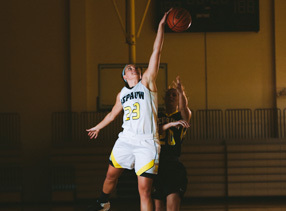 "But those efforts are still uncoordinated very often. 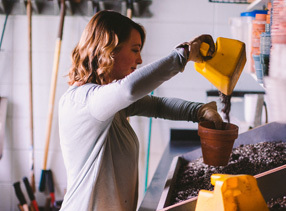 They're not concerted efforts." The author of several books, including the bestsellers Chechnya: Life in a War Torn Society, and Conversations with Gorbachev: On Perestroika, the Prague Spring continued, [Download Video: "The Planet's Future" - 7245kb] "Without a doubt, everything will depend on which course the world community will take in addressing the problems that I have described. The future of our planet is at stake. My experience -- the experience of a person who has been in politics for 50 years -- indicates that we will soon see the beginnings of solutions... that will change the course of development for the better, that will improve relations between the human society and the environment." 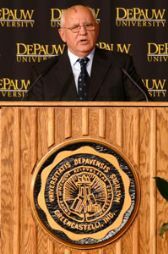 Mikhail Gorbachev concluded his Ubben Lecture, which was followed by a question-and-answer session moderated by DePauw student journalists, by recalling a famous quote from another president. John F. Kennedy once said, ""If a free society cannot help the many who are poor, it cannot save the few who are rich." 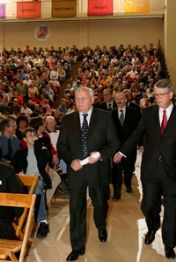 Gorbachev told his Greencastle audience, [Download Video: "Expanding Our Reach" - 10,382kb] "I believe that today we can interpret this phrase somewhat differently. In the global world, this concerns the entire world, the entire planet. If some of us think that the 3 billion people who live in extreme poverty should be of no concern, that's a big mistake. And if we continue to make that mistake, we could see disastrous consequences. And therefore, I believe that this thought of President John F. Kennedy should be applied internationally. We can only have a common future -- a future for all, or no future at all," Gorbachev asserted. 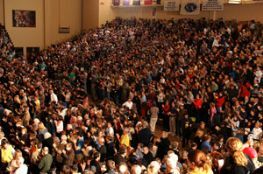 The audience responded with a long and loud standing ovation. 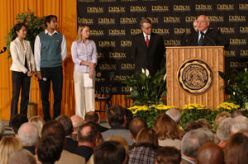 After his speech, Gorbachev held a news conference with reporters from DePauw's student media organizations and their professional counterparts. [Download Video: "A Blow to Democracy" - 4332kb] "This whole thing in Iraq has done a lot of damage," he said in response to a question about the war. "It has been a blow to the U.N. Security Council, a blow to the alliances and the partnerships that the United States has in the world, a blow to international law, a blow to democracy." Gorbachev said, at the outset of the battle, he told the Russian media it was "a big political mistake to start that war," adding, [Download Audio: "More on the War" - 187kb] "The goals that were set have not been achieved. The weapons of mass destruction have not been found... [Download Audio: "The War on Terror" - 413kb] "And I believe this has not helped fighting terrorism and addressing the Middle East crisis. I believe that the situation in the Middle East has become actually more difficult. 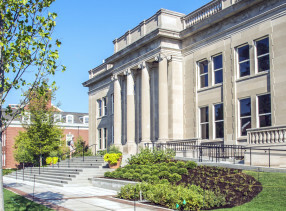 The process of political reform is proceeding with a lot of difficulty, too." The former Russian leader, who was greeted by DePauw students and faculty members upon his arrival at Putnam County Airport, added, [Download Audio: "The Right Way to Go" - 367kb] "I believe that the right way to go is to give more and more responsibilities to Iraqis themselves. Right now, everyone in the world believes it is still continued occupation." While America will play a crucial role in the rebuilding of Iraq, Gorbachev says "it's also important to make sure that other countries are not pushed aside; that they, too, have a chance to cooperate and be economic partners with Iraq. I believe the way to go is to try to build some kind of a cooperation." Eventually, withdrawal of American forces from Iraq "should be the goal," Gorbachev concluded, "based on the respect of the sovereignty of the Iraqi people." He also asserted, [Download Audio: "Success" - 235kb] "I believe that any serious person, including those of us who were and are very critical of the invasion of Iraq, should not want America to be defeated in Iraq." 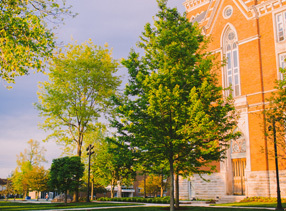 The Ubben Lecture Series has brought distinguished individuals to the DePauw University campus since 1986. Author and feminist Naomi Wolf spoke on September 21; other Ubben Lecturers have included former British Prime Ministers Margaret Thatcher and John Major, Spike Lee, Mike Krzyzewski, 2004 presidential candidate and retired General Wesley Clark, Ambassador Paul Bremer, Hotel Rwanda's Paul Rusesabagina, National Football League Most Valuable Player Peyton Manning, Zbigniew Brzezinski, Barbara Bush, General Colin Powell, Ross Perot, and ice cream entrepreneurs Ben & Jerry. 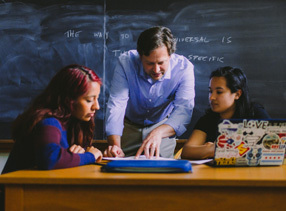 To view a complete roster of Ubben Lecturers -- which includes links to video clips and news stories -- click here.